From Malinda Lo, author of ASH, HUNTRESS, ADAPTATION and INHERITANCE, comes A LINE IN THE DARK. This dark, mysterious novel revolves around Jess Wong, an observer and an artist who is in love with her best friend, Angie Redmond. Jess isn’t bothered that Angie doesn’t share her feelings, until Angie starts dating Margot, a girl from a nearby boarding school. Jess is a talented comic book artist and has earned a spot at the Pearson Brooke Academy Arts Exchange Program, a program for talented student artists from the local public high school at Margot’s boarding school. With Jess and Angie becoming more and more involved in Margot’s circle, and Jess’s increasing jealousy toward Margot, everything around them starts to become increasingly complicated, especially when a girl from Pearson Brooke suddenly goes missing. "Lo was able to create an effective mystery story in A LINE IN THE DARK, and even though I found the beginning very slow, once I got to the final third of the book, I couldn’t put it down." 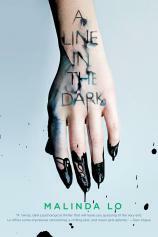 While the premise and concept of A LINE IN THE DARK is certainly intriguing, the novel was somewhat slow until its tail end. The true mystery of the story does not even occur until about two-thirds into the novel and much of the beginning feels like filler chapters. The writing itself, however, is perfect for a mystery novel. It is told in first-person for much of the novel and captures how observant Jess is, but the writing has a somewhat withholding and cold quality, keeping the reader ever so slightly in the dark and really creating a sense of mystery. Jess’s comic series about a female action hero, Kestrel, plays an interesting role in the story. Kestrel’s story and Jess’s story intertwine, often times Kestrel reflecting what Jess is going through. It was unique to read a novel in which the protagonist’s art develops along with the story itself. Once the mystery began in the end of novel, the writing style became more interesting. It alternated between transcripts of audio recordings and an interesting third-person style narration with an omniscient narrator that makes the reader the observer. Lo was able to create an effective mystery story in A LINE IN THE DARK, and even though I found the beginning very slow, once I got to the final third of the book, I couldn’t put it down. A LINE IN THE DARK tells an interesting story that any mystery lover (especially a murder-mystery lover) would appreciate. The story begins with two best friends, whose friendship starts to alternate between weak and strong. As Jess gets drawn into the world of Margot and the Pearson Brooke students, the true nature of her best friend’s girlfriend is revealed and a quiet, New England town becomes the site of a murder. I would recommend A LINE IN THE DARK to anyone looking for a mystery that doesn’t exactly start off as a mystery. I wouldn’t consider this book a great one if you are trying to read something quickly, but if you’re willing to wait a little while before the action really starts, A LINE IN THE DARK can appeal to anyone.